We return perhaps half a year following the end of Season 3 to the prison group as a thriving community. Time has passed and, with the influx of new people from Woodbury and elsewhere, the prison has been fortified and altered to suit its new occupants. Rick surveys the surrounding with none of season 3’s urgent anxiety. He’s got music to keep him company as he works in the garden, and walkers separated by the prison’s fences look on. Rick strikes a gun buried in the ground. At the fence, the walkers clamor, and Rick discards the gun. Carl has named a pig Violet, and she looks unwell. Rick scolds halfheartedly, “I told you not to name them. They’re not piglets anymore; they’re food.” But he relents and calls the pig by name as well. The common area has been transformed, and the formerly austere prison compound has some community touches. Daryl receives greetings and admiration from many voices. He is popular, and though the attention for things he considers simple (like hunting) makes him outwardly uncomfortable it’s clear he likes being appreciated. Leadership wears well on him. Others are killing walkers along the fences as Daryl and Carol plan the day. There’s worry that the accumulation of walkers could get ahead of the group. It’s clear that despite the comforts of home they have not grown complacent. Glenn, reluctant about Maggie’s supply run, volunteers to go in her stead. Meanwhile others are saying their farewells to their significant others. Tyreese explains to Karen how he can no longer stand fence duty. “When they’re comin’ at you out there, it’s different. You don’t even think about it.” But from inside the safety of the prison, killing the walkers disagrees with him. Beth’s boyfriend Zack is going on the run; he tries to get Beth to sympathize about the dangers outside the prison and she blithely refuses to say goodbye. Sasha is in command along with Daryl, and reluctantly agrees to let newcomer Bob join the run. Still, Rick heeds the request, another sign of his step back from leadership and how agreeable he finds it. Outside he meets a creepy woman named Clara, filthy, hungry, desperate, and generally shady. He gives her food and says before she and her husband Eddie can be invited to camp they will need to answer three questions to his satisfaction, but if she tries anything she will lose everything. “I don’t have anything left to lose.” Foreboding! It’s clear Carl doesn’t fit with the other children, even Patrick, the amiable boy who admits he is immature. It’s also clear Carl has a good sense of his world; it’s harmless to name pigs in spite of them being neither people nor pets, but naming walkers has the potential to soften or weaken people, introducing split seconds of doubt that could get someone killed. But Carl sneaks into story hour, though he has deemed himself too mature for kid stuff, because in spite of his perspective he still wishes to be accepted and have friends. He discovers Carol is teaching the children knife skills. Patrick is unwell and leaves early, and as Carol spots Carl she begs him not to tell his father. Daryl leads a foraging group to a Big Spot store. As they gather walkers, Zack guesses Daryl used to be a homicide detective. He and Michonne play along, and Bob lingers eyeing a pair of legs in the yard before the scene opens up to show walkers and a crashed helicopter on the building’s roof. Inside, Glenn casts a long look at a birth announcement, while Bob makes similar faces at a bottle of liquor. Water drips from the ceiling. When Bob reconsiders and shelves the bottle, the entire rack topples, crashing down on top of him. As Daryl and Tyreese work to free Bob, walkers begin falling through the soft spots in the ceiling. Rick follows Clara to her camp, trying to engage her and get a feel for her character. She admits that Eddie prepared her for doing what needed to be done, like eating rotting fruit, hiding, and leaving people behind. She looks to Rick. “Did you do things like that? Did you? Do you think we get to come back from that?” He says he hopes so and they arrive at a small tent. Clara kneels, seemingly talking to nothing before attacking Rick. A wriggling bag comes into view–her husband Eddie is no longer alive, and she wants to feed Rick to him. “He’s starving! He’s slowing. He needs something alive.” When that fails she stabs herself to be reunited with her husband. As she dies she asks for Rick’s questions: How many walkers have you killed? How many people have you killed? Why? It is literally raining men as walkers fall from the ceiling. Unprepared, everyone is in a bad situation. Michonne is lethal as usual, and Sasha impales a walker with a pool cue. Bob is still stuck and Daryl ascends a mountain of beer to gain higher ground, but the helicopter is about to fall and time is running out. They free Bob but Zack gets bit. Back at camp Rick finds Violet apparently dead. Tyreese returns to Karen, confessing he doesn’t like the outside any more than he likes fence duty. Maggie tells Glenn she’s not pregnant, and his relief is beyond obvious. “I didn’t want to, but we could’ve. We can have lives here…. I don’t want to be afraid of being alive.” But Glenn counters, “Being afraid is what’s kept us alive.” Daryl tells Beth about Zack. Matter of factly, she changes the “30 days without an accident” sign to read 0. He is surprised by her lack of emotion but she says she doesn’t cry anymore, and that she was just glad to have known him. Michonne is still plotting a route to Macon in search of the Governor. 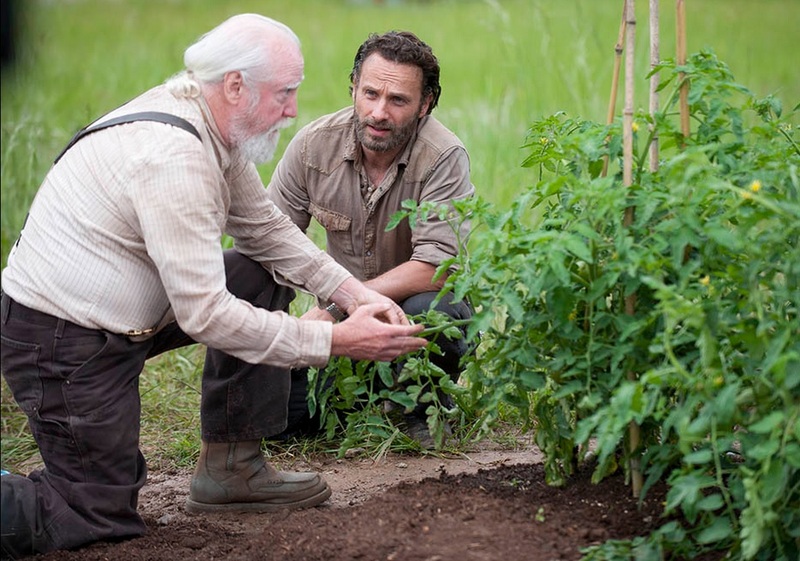 Hershel comforts Rick. In the dark of the Prison, Patrick leaves wet footprints as he staggers to the showers. What earlier seemed like squeamishness at the idea of knife practice now is a legitimate illness; he is hacking, coughing, sweaty and clearly very sick. He collapses in the showers. Outside his footprints are drying. The shower fills with blood; Patrick has not survived his fall, and wakes as a walker inside the prison. Rick has beaten his sword into a plowshare, both literally and metaphorically trading his gun and time killing walkers for a hoe and a garden patch. It’s clear the violence still tires him; he is reluctant to bring his gun when he checks the traps, and his argument about six bullets suggests he is overwhelmed by the world outside the walls. He blocks it out with music and headphones, ignores it by sticking close to the prison, but that doesn’t make it any less real. With Rick’s new role as a homesteader Daryl has stepped into the position of leadership and is wearing it well. The camp is clearly thriving, and people are peaceful; when Daryl speaks they listen, and likewise when they speak Daryl listens. It is as close to harmony and security as one might hope for in such a world. Still, there is trouble on the horizon. Violet the pig is sick, dead by the end of the episode, and Patrick goes from chipper and friendly to violently sick and dead in the space of a day. A walker is in the prison while everyone is asleep. Newcomer Bob might be an alcoholic. The walkers are grouping to press against the fences. Tyreese is worn down by so much killing and violence. Walkers have been stealing food caught in the group’s snares. The threat of the Governor is still looming. Some of those kids are jerks. Like any good tragedy, Season 4 is poised to shift from order to chaos. They have gone 30 days without an accident, but how many are to follow? I like the Darryl/Carol thing but, really, isn’t he out of her league? And didn’t it look like Rick and Michonne exchanged “a look”? Dude I think Michonne and Daryl could make, like, the best bang. The romance between Daryl and Carol seems very one-sided to me; it seems like he has always seen her as a mother beginning with the search for Sophia in S2 and continuing on with the Cherokee Rose bit like a symbolic acknowledgement that she is providing the nurturing he never had from his own family. As for Farmer Rick…. I don’t even know. Withholding my opinion to see how batshitcrazy he is this season. I hope not too much. I hated the whole hallucinations story line and thought that was cleared up. Now – batshit crazy Carl could be fun. Agreed; most of what they did last season got old real fast. Anyway, nice to see you back for another season! I love that we’ve hit the “Cassie blogs” time of the year. I spent this entire episode with Evan in my ear about Clara, “She’s lying. She’s lying. She’s DEFINITELY lying.” I’d say he was right, except she never really lied, she was just batshit. The fact that Rick identified so much hit me right in my emotions. I go back and forth between respect for Carl and wondering what the eff is wrong with him. This episode I leaned toward respect, but I’m sure he’ll do something to prove he’s still only about 13 in a minute. The same with Beth, although I finally feel like she got a chance to shine a little in this episode. Also, loving the Group Mama and Group Papa vibes coming off Carol and Daryl. Yeah dude I’m always suspicious of the unknown in things like this and when Clara was like I HAVE NOTHING LEFT TO LOSE I was like WUT? Thought you had a husband. Or is HAD the operative sentiment? And I think Beth is really a wonderful example of being a strong and rounded female character with a personality and interests, without having to fall into the Joss Whedon trap. Love the Natalie Portman quote! HAHAHA TRUTH. Yo did you get your phone sorted? Gonna come back and make a good comment after I’ve seen the episode. I DVR’d it.